Anyone who brings home this book will be in big trouble. 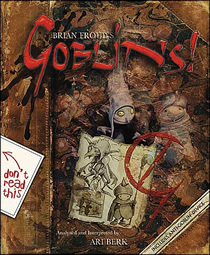 Renowned artist Brian Froud and scholar Ari Berk have conducted a thorough investigation into the goblin realm (For the uninformed, goblins, a subspecies of faery, are those maleficent creatures that cause all manner of havoc in the human realm). The fruit of their labor, however, turned out to be a rotten apple: the book is infected with goblins! Now, thanks largely to Froud and Berk's continuing carelessness, the noxious, viscid, and largely nonsensical volume has been unleashed on an unsuspecting public. Among its pages are reproductions of the ancient, odoriferous Codex Goblinensis; a glossary of common goblins and their markings; and a gazetteer of goblin photographs taken with the arcane Goblin Camera. Those fearing an infestation can refer to the section detailing how to determine if you've "got goblins" and, if so, what you can do about it (There is nothing you can do about it). Combining the folkloric approach of Faeries with the utter wackiness of Lady Cottington, this is the team's most visually rich and outrageous opus yet. Brian Froud is an award-winning illustrator, author, and faery authority. His books include the international best-sellers Faeries, Lady Cottington's Pressed Fairy Book, Lady Cottington's Fairy Album, and The Faeries' Oracle. He also served as the conceptual designer on Jim Henson's films The Dark Crystal and Labyrinth. Froud lives in Devon, England. Ari Berk is a folklorist, poet, and scholar of literature, ethnography, iconography, and comparative myth. He is also the author of popular titles for children, as well as The Runes of Elfland with Brian Froud. Berk is associate professor of English at Central Michigan University.